Swan Lake is probably the most exceptional phenomenon in all classical ballet literature. With its nonpareil beauty, dreamy poetry, seductive magic and romantic imagery, it braids the fairy tale into dance and music. Composed by Pyotr Ilyich Tchaikovsky (1840-1893) – his first ballet score commission, a fact which nevertheless raised eyebrows since at the time ballets were written by ballet “specialists” – Swan Lake proved to be the most popular ballet in the history and among the composer’s most renowned works. An unwearied hit among audiences and the dream of ballerinas all across the world, today, over 140 years after its premiere at Russia’s Bolshoi Theatre (4 March 1877), it is the hallmark of the art of classical ballet. A challenge for both dancers and choreographers though it is, each classical ballet company has to include this masterpiece in its repertoire. In Egypt Swan Lake premiered in 1991 when the Cairo Opera Ballet Company performed it with the late Abdel-Moneim Kamel as artistic director. 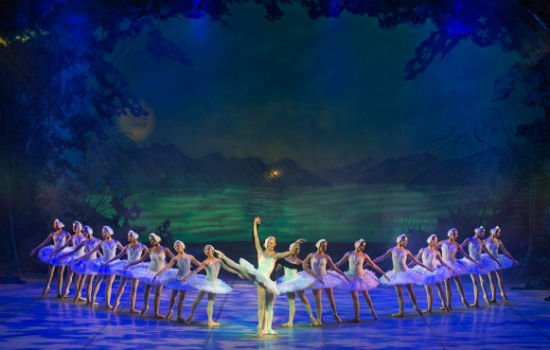 The success of the ballet and the interest of the audience prompted the troupe to continue staging Swan Lake through the years, often placing it in the programme every other year. This year the ballet is being revived by the company’s current artistic director, Erminia Kamel and performed at the Cairo Opera House between 10 and 13 January and the Alexandria Opera House on 17 and 18 January. In four acts, Swan Lake tells the story of Prince Siegfried who falls in love with Odette, a princess who was turned into a white swan by an evil sorcerer, Baron von Rothbart. Odette lives close to the lake and regains her human form only in the dark of the night. The spell can only be removed by the one who will give her an oath of eternal love, which is what Siegfried does. The third act takes us back to the palace, where the Queen organises a ball in order to present three princesses to her son so that he can choose one as his future wife. Three princesses – Hungarian, Polish and Italian – appear, performing traditional dances from their countries: the czardas, the mazurka and the Neapolitan dance respectively. Faithful to his vow, the price rejects all three. The fanfares announce the arrival of a mysterious stranger who introduces yet another princess dressed in black and therefore referred to as the Black Swan, who looks exactly like Odette. What Siegfried doesn’t know is that the mysterious princess is not Odette but Odile, the daughter of von Rothbart. Siegfried and Odile perform a magnificent pas de deux. Deceived by the resemblance, Siegfried tells his mother that he will marry the alleged Odette, breaking the oath given to the real Odette. The plotters reveal their true faces and Siegfried runs to the lake hoping to find and apologise to his true love. But in the fourth and final act, we discover that the spell is too strong and since the prince broke the oath, Odette will remain a swan forever, bringing the life of the protagonists to a grim end. Evil triumphs. 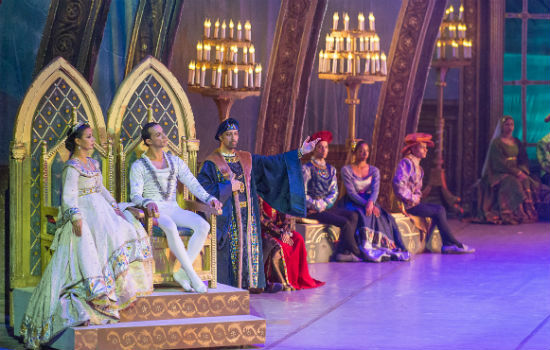 But this is the original story with staging based on Marius Petipa and Lev Ivanov’s choreography: the first designed the palace scenes, the latter creating scenes next to the lake. For over a century, this version is considered to have reached an absolute perfection and beauty, and has become a foundation for all the choreographers. The artists are, however, invited to add their own touches, on the level of the plot and choreography, as Abdel Moneim Kamel did. Swan Lake performed by the Cairo Opera Ballet Company walks the audience through to a surprising and warm ending that speaks of Kamel’s longings translated into beauty by his creative powers. But the surprising ending is not the only highly imaginative modification. Kamel also created a bridge between Act 3 and Act 4. Here the choreographer introduced a girl dressed half in black and half in white. With the help of ultraviolet light and four male dancers who lift her off the ground, the girl gives the impression of floating in the air. She becomes a dream in a deeply poetic scene drawn over the ballet’s light motifs. It is at this moment that Kamel creates an abstract tableau embedded in classical ballet, whereas viewers can ponder the magical scene’s thematic significance on the one hand and its technical execution on the other. Swan Lake is about the struggle between good and evil. It is about betrayal, pain, the power of love and emotions that cross the limits of life and death. Challenging the viewers’ expectations, this anti-story infuses the ballet with poetic fantasy and subtle lyricism, and it has consistently captivated the hearts of audiences around the world. The choreography is also challenging to dancers and troupes who spend months preparing the work. In many scenes, the corps de ballet creates wonderful images which are based on perfect synchronisation. Among the famed scenes is Dance of the Little Swans (Dance of the Cygnets) where four ballerinas are joined with their crossed hands and dance together. The scene demands absolutely flawless synchronisation between the dancers, so that justice can be done to the beauty of Ivanov’s choreography. If any of the four girls falls out of tempo, the emotional purity of the scene collapses and turns it to an aesthetic disappointment. No wonder, Dance of the Little Swans is often used as material for entertainment sketches, for one imperfection in the rhythm and movement of the scene turns it into a comedy gig. Indeed, Swan Lake is filled with challenges. Understandably it is considered the most difficult work to be performed by any classical ballet company. The sheer fact that Odette and her anti-heroine Odile are usually performed by the same ballerina puts remarkable emotional and technical demands on the dancer. Odette-Odile shifts constantly between the moods portrayed by two contrasting characters, between a lyrical, soft white swan and a seductive, sharp black swan. When the ballet premiered in Egypt in 1991, the roles were given to two ballerinas. It wasn’t until the 2010s that Kamel felt the Cairo Opera Ballet Company was ready for the double-role requirements. It is now performed by one ballerina. At the end of act 3 when the ballerina is already exhausted by the choreography demands, Odile performs the famed 32 fouettés (pirouettes on pointe shoes). As the story goes, Petipa has included the fouettés in the 1895 version of Swan Lake especially for the Italian prima ballerina Pierina Legnani, who having thrilled the audience was asked to repeat them. She then repeated 28 fouettés, probably setting the everlasting record of technical strength. And the Egyptian audience too is duly treated to 32 fouettés, a breathtaking element of Swan Lake’s choreography. The mesmerising choreography, extraordinary events and plot twists, the secret of Swan Lake’s lasting success also lies in the music. Elegant polonaises, delightful waltzes, energetic czardas and fiery Spanish dances are but a few of its captivating components. Rich orchestration and deeply emotional passages make the experience as rewarding to the ears as it is to the eyes. Tchaikovsky’s melodies blend with the art of harmonies, and many of them remain easily recognisable even to non-ballet regulars. The waltz from Act 1, Dance of the Goblets, the already mentioned Dance of the Little Swans, the Dance of Ballet Corps and Dwarfs are among the many tunes that bring Swan Lake close to the audience’s hearts while continuing to set a benchmark for the ballet composers and creative aesthetics. The cast of Swan Lake includes soloists of the Cairo Opera Ballet Company: Anja Ahcin as Odette-Odile, Ahmed Yehia as Siegfried and Hany Hassan as Von Rothbart (on 10 and 12 January in Cairo), Katya Ivanova, Mamdouh Hassan and Islam El Desouky (11 January in Cairo and 17 January in Alexandria), Katerina Zaberzhnaya, a guest dancer Serguei Neikhsin and Hany Hassan (13 January in Cairo and 18 January in Alexandria). Choreography is by Marius Petipa, Lev Ivanov and Abdel-Moneim Kamel, with Erminia Kamel as artistic director. The Cairo Opera Orchestra is conducted by Nayer Nagui. Next Myths and methadone: Will Egypt’s laws bend to the rising tide of drug abuse?